As mentioned, seniors are a storehouse of experience and wisdom, earned over a lifetime. They have many stories to share and will love you just for listening to them. In older days, when grandparents were the main caregivers of the children while their parents were out working, the elders would instruct the younger generations through storytelling. 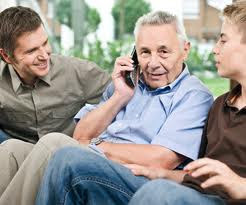 Because many seniors are hard-of-hearing, be sure to speak to them in a loud voice. A guaranteed way to establish good relations with your loved one's grandparents is to relate to their interests and hobbies. What does nan love to do? Develop an interest in it or use it to build a better rapport around. Maybe nan loves to cook food; you can drive her to the local farmer's market when you are visiting and help her bring home pounds of fruits and vegetables to cook. She may also have a lot to teach you so be open to learn, as you never know what jewels elderly people can impart on you. Help your partner's grandparents with household chores and yard work, and they are sure to appreciate it. They will also enjoy learning new things from you, such as things you can do on the Internet. Like everyone, seniors love to be loved and appreciated. So always thank them and show how much you appreciate them. Simple things like thank you cards and gift baskets for a holiday celebration can go a long way in their books. Adding a handwritten letter to those cards and gift baskets is a thoughtful way to make any grandparents' day. If grandmother is partial to certain things, like perfume for example, a gift of a bottle of her favourite perfume is a lovely gesture. There may well be a gulf between you and your granny-in-laws, and their views may be rooted in another age and time. If there are certain topics that cannot be reconciled between you, like politics or religion, stay away from them. If the topic is brought up, find diplomatic ways to change the subject or just say “I'd rather not spend my time arguing with you, nan. Let's spend it doing something else." Some seniors love a good argument, so engaging them in debates in a good-natured way can be good, just never take it personally. Never forget that your partner's grandparents are people who have lived long, full lives and are your partner's predecessors. Give them respect, regardless of the quality of your relationship with them. Hmm, I think I have to send this link to my sister in law..